If using crescent rolls: Unroll dough into 1 large rectangle on work surface. Press into 12x9-inch rectangle, firmly pressing perforations to seal. If using dough sheet: Unroll dough on work surface. Press into 12x9-inch rectangle. Cut dough into 12 squares. Gently press squares into 12 ungreased mini muffin cups, shaping edges to form rims 1/4 inch high. 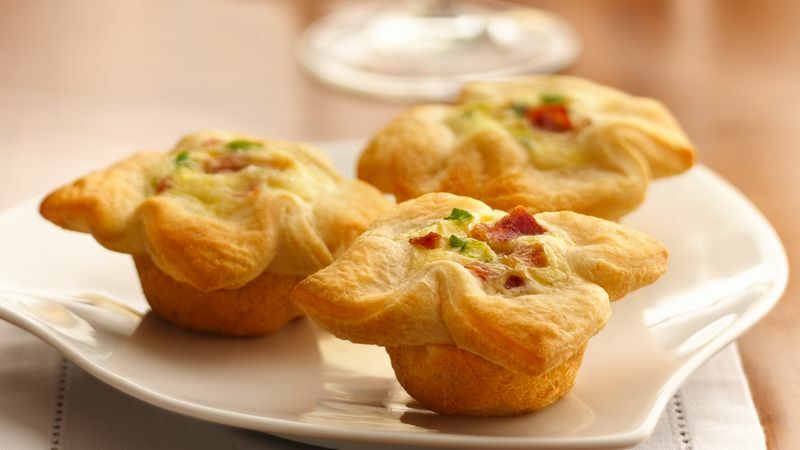 Spoon cheese evenly into dough-lined cups. Top each with onions and pimientos. In small bowl, beat egg and whipping cream with wire whisk or fork until blended. Spoon slightly less than 1 tablespoon mixture into each cup. Bake 15 to 20 minutes or until edges are golden brown and filling is set. Cool 5 minutes. Remove from muffin cups. Keep refrigerated dough in the fridge until you’re ready to use it; cold dough is much easier to work with. Have all the other ingredients ready to use.